This is the best Black Friday 4K TV deal under £500 | What Hi-Fi? At its former £600 price, the 50-inch Philips 50PUS6703 4K HDR TV beat several of our 2018 TV Award winners, including LG OLEDs, to claim ‘Product of the Year’ status as the best-value TV of the year. It didn’t exactly need a price drop to stand out, then - but who’s going to argue with one? Certainly not us. Especially when the it's a very decent 33% off our reviewed price in the Black Friday sales. It’s one of the easiest Black Friday deal recommendations we can make. 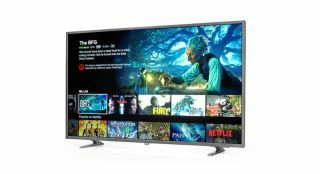 At the Philips 50PUS6703’s original price, we were impressed at the dynamism and insight of its picture performance, as well as its decent range of streaming and catch-up apps, including Netflix (4K and HDR) and Amazon Prime Video (4K), BBC iPlayer, ITV Hub, All4 and Demand5. Then there’s arguably its best feature: three-sided Ambilight, which effectively projects the colour palette of whatever’s on screen to the surrounding walls via little LEDs. Make no mistake, this is a great TV for anyone who can accommodate a 50-inch screen. Want a new TV this Black Friday? Look no further.